Stealthy Mom: One potato, two potato... fifty pounds of organic potatoes! One potato, two potato... fifty pounds of organic potatoes! Potatoes are members of the infamous Dirty Dozen, the fruits and vegetables that are the most contaminated with pesticide residue. I had no idea until recently just how serious the issue was. 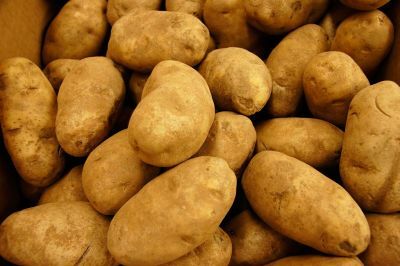 A 2008 USDA study found 37 different pesticide residues on potatoes. Since potatoes are a root crop, excess pesticides in the soil are absorbed right into the flesh; peeling will not remove the contamination. Buying organic potatoes is the safest plan of action for feeding our children (next to growing our own.) Buying organic food also rewards producers who choose more sustainable methods. It is a win-win for the environment and for our family's health! Our local grocery store does not carry much organic produce, but will gladly order what they can if we will take a whole case. The store is part of a major chain of employee-owned stores, so anything that is available to big-city-folks can make its way to Southwest Iowa on the next delivery truck. This afternoon I loaded up the kids and we picked up our special order of organic potatoes: fifty pounds of beautiful russets. These taters, despite the California brand, were imported from British Columbia. To meet import specs they had to be scrubbed free of all soil. Pre-scrubbed, organic, and for the same price as national brand chemically-treated potatoes! Who wouldn't choose these? It is a good thing that potatoes are so versatile. Baked, mashed, soup, perogies, fries... I have found a recipe link-up devoted to spuds, over at Life as Mom's blog, and it was timely.